Leaf sales have dropped the past two months, trailing GM's rechargeable Chevrolet Volt and Toyota's plug-in Prius in May. (Bloomberg) -- Nissan Motor Co. will overcome a slowdown in deliveries of its all-electric Leaf vehicle, doubling U.S. sales to 20,000 during its current fiscal year, the vice chairman of its U.S. unit said. A new plant in Smyrna, Tenn., will be ready to make the cars in December, helping boost supply before the fiscal year ends in March, Nissan's Bill Krueger said Saturday in Los Cabos, Mexico, where he was visiting for the B-20 business summit. The automaker also is expanding sales nationally after launching in seven states, he said. 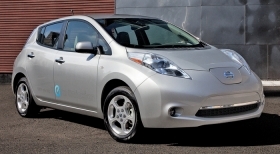 Leaf sales have dropped the past two months, trailing General Motors Co.'s rechargeable Chevrolet Volt and Toyota Motor Corp.'s plug-in Prius in May. Volt deliveries more than tripled to 1,680 units in May, while Leaf sales fell 55 percent to 510. The Leaf is made in a single plant in Japan. Japan's three largest automakers are producing vehicles in North America at a rate indicating each will set records this year. Nissan made 1.18 million in the United States and Mexico last year, its highest volume to date, and may make as many as 1.35 million at the current rate.